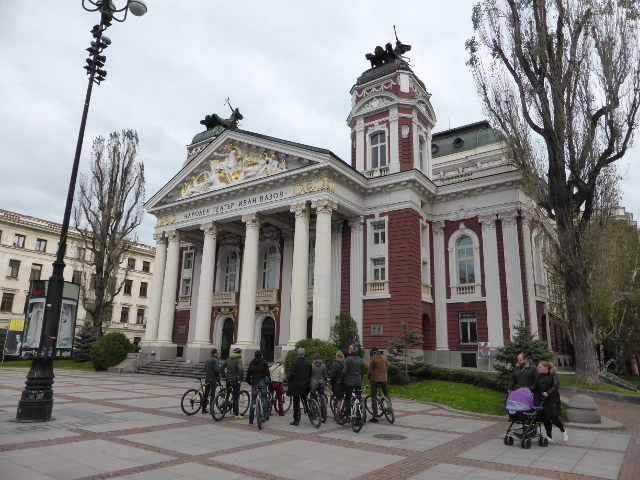 Having written about cycling in Sofia in my previous post this one is about my impressions of Sofia as a tourist in the two brief tours that I took around the city centre in my short visit. 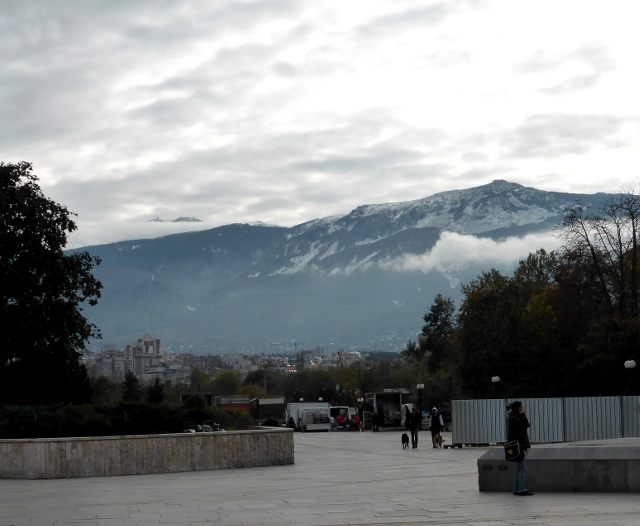 It was very much late autumn here with the first cold temperatures of the year coming in, down to about four degrees centigrade overnight and there was snow on the Vitosha Mountain that overlooks the city. The city was mostly wrapped in a steely grey grip that briefly lightened for our afternoon bike tour but otherwise kept things a bit dull so maybe we didn’t see the city at its best. But I must say the mountain itself is a great landmark as you move about, forever on the skyline and real symbol of the city. I really wish I had enough time to take a trip up there, it looked amazing for walking or mountain biking but it would be a substantial excursion of a few hours. 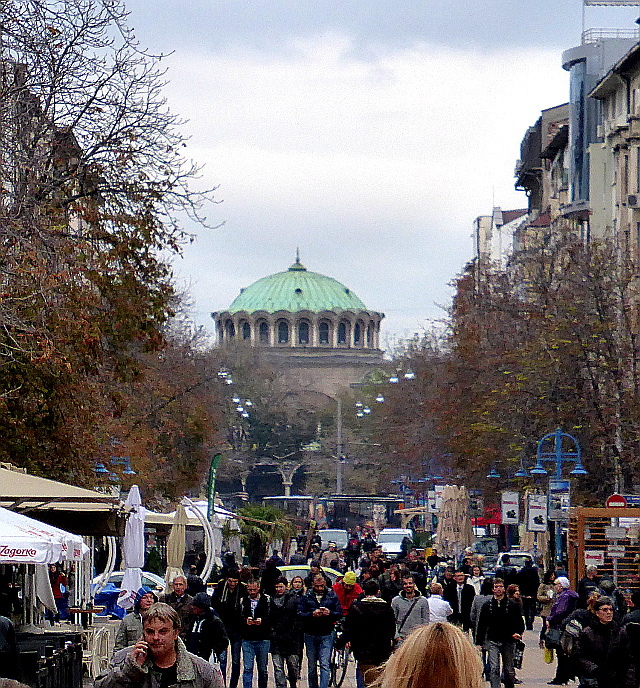 It would probably be fair to say that Sofia is not one of Europe’s tourism hot spots. Nor one its wealthiest cities, so it has a slightly run down feel with buildings, roads and parks often in need of some repair and restoration. What it has in its favour is a rather sleepy, quiet nature because for a capital city of well over a million people we did spend some time wondering where they were. 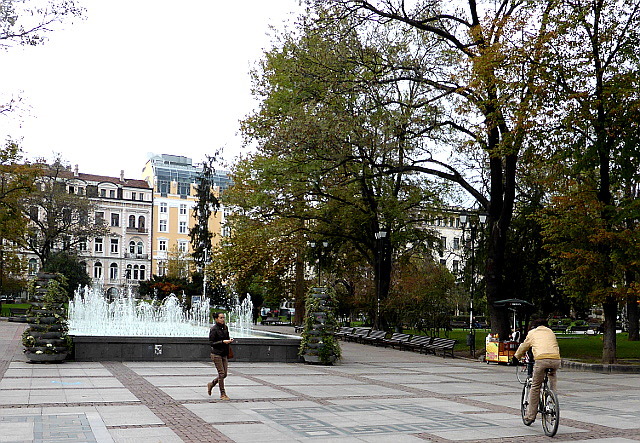 Little of it is completely car fee except the main shopping drag of Vitosha Boulevard but the main city centre buildings and parks are mainly in two central neighbourhoods which were easily accessible by bike, foot and metro so it was actually a really easy city to navigate. 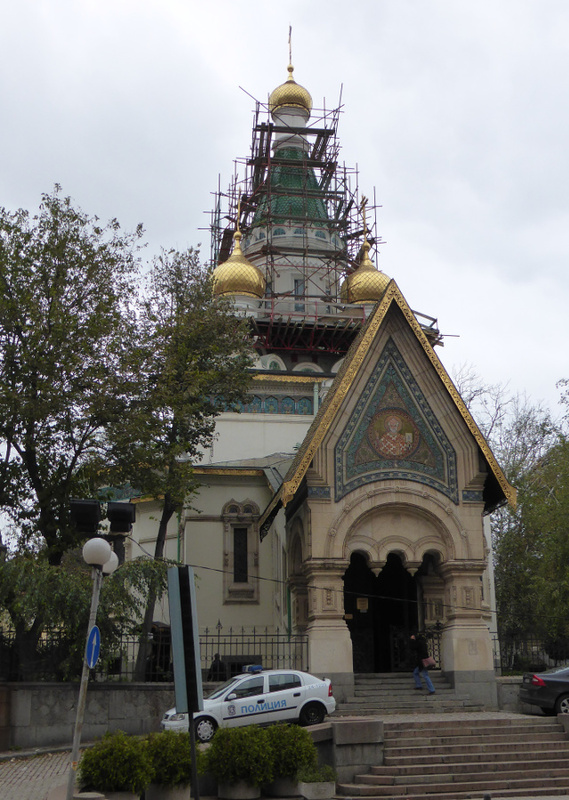 What Sofia also has is an incredible history. Its pre-Roman history goes back to 4BC, then it was a major Roman centre for nearly 500 years. At times it was part of various Bulgarian empires which brought a Christian heritage but for another 400 years it was part of the Ottoman Empire. 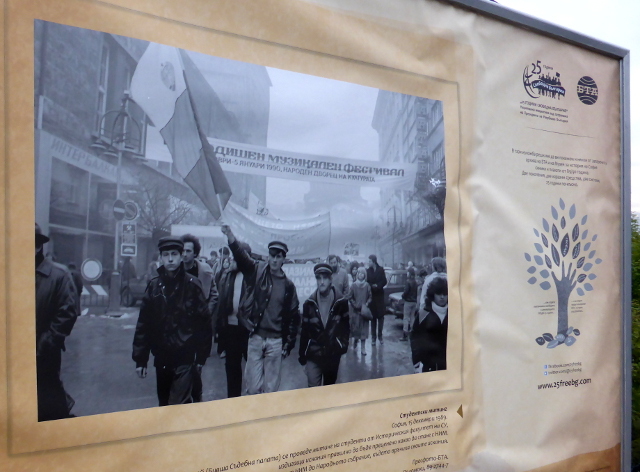 In the 19th and 20th Centuries it fell into the Russian sphere of influence with a communist government from 1946-1990. 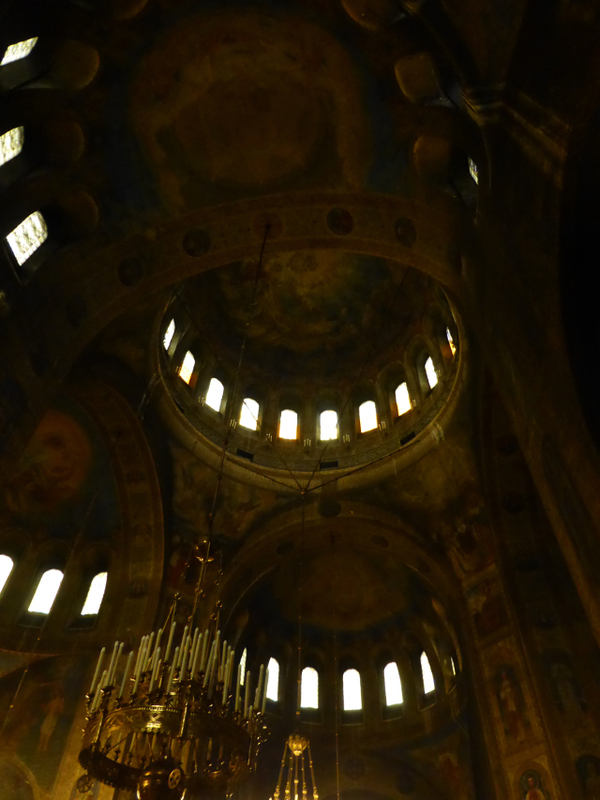 Unfortunately it was flattened and rebuilt several times in that process so much of ancient Sofia is buried under the later layers and it is a bit of a detective exercise to see the differing elements. 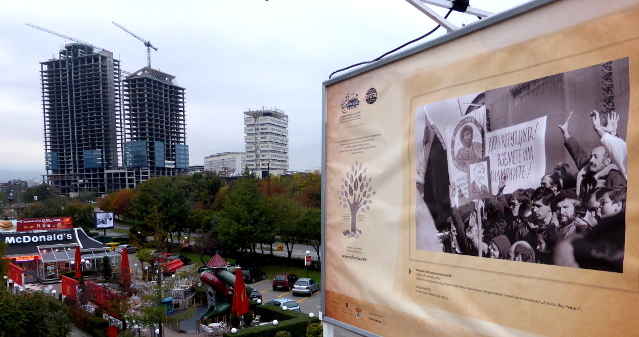 What we mainly saw to represent the city history were two distinct groups of buildings. 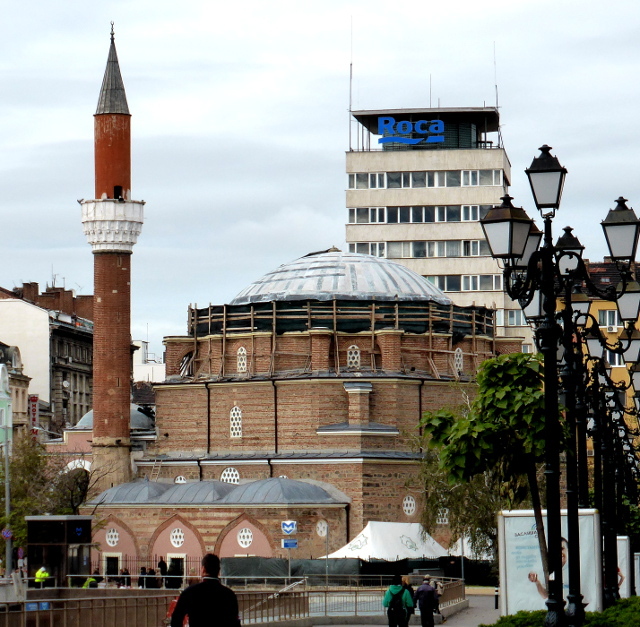 The first were the religious sights – cathedrals, churches, mosque and synagogue reflecting the diverse heritage of the city. 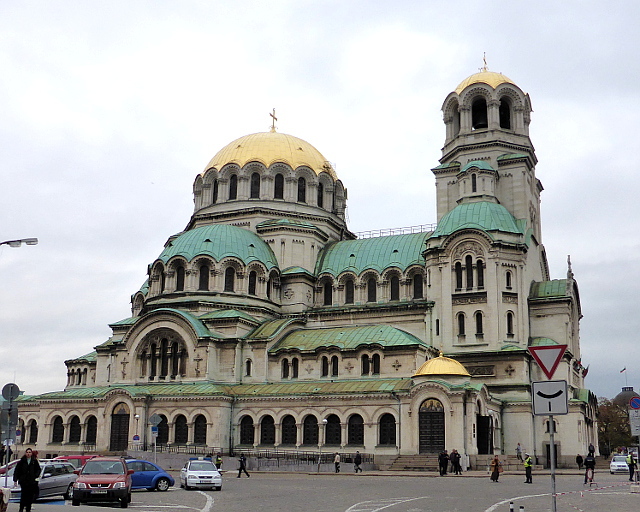 Chief of these was the Alexander Nevsky Cathedral which turned out to be quite a surprise for me. From the outside it is a giant of white and gilded domes. 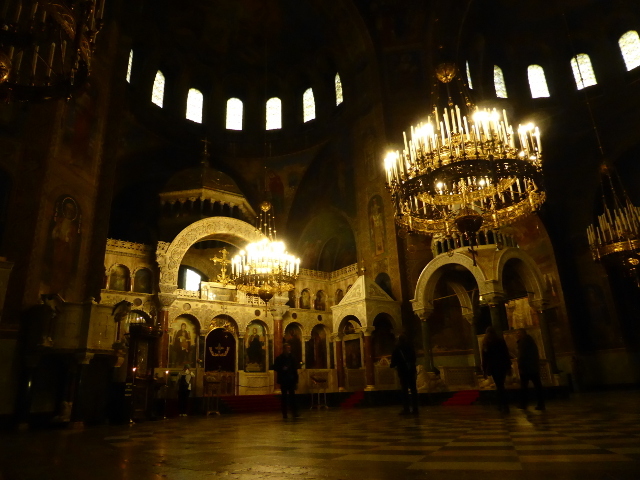 But inside it was dark and unlit except for tiny windows up in the dome and large groups of candles. One could sense the detailed painting on the walls and up in the heights the dome could be brightly decorated but it was the darkest, gloomiest major cathedral I have ever been in, almost cave-like. 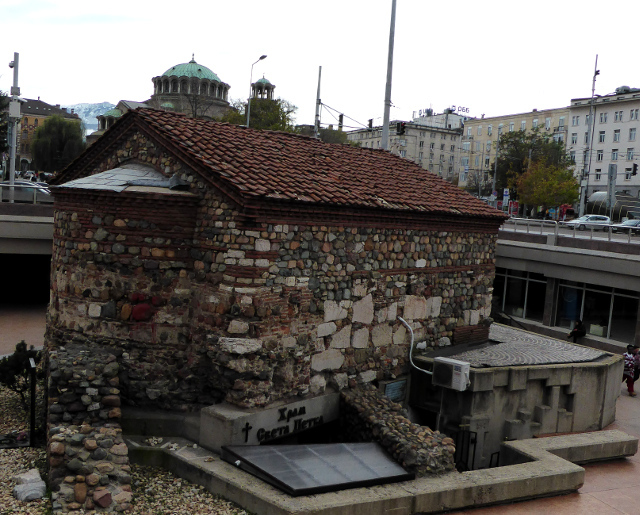 By complete contrast the tiny Saint Petka Church was a medieval church sunk below the level of the city roads close to excavations of the old city which are being unearthed in front of a new metro station, one of the few surface signs of an older Sofia. 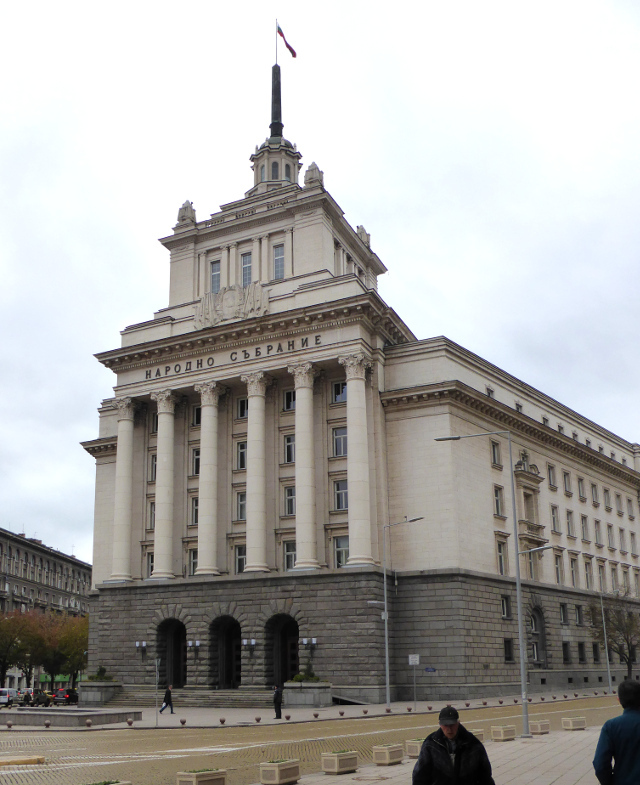 The second group of buildings reflect the more recent Soviet past. Almost inevitably there is a huge block of Soviet architecture of which the most striking was the former Communist Party Building, the Largo building which is a classic of its type. 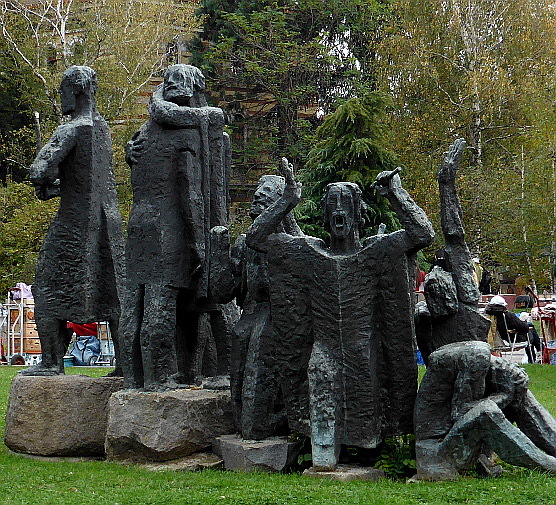 The memorial to the Soviet Soldiers also survived the end of the communist period in a small park to the west of the city centre with its dramatic statues and friezes. 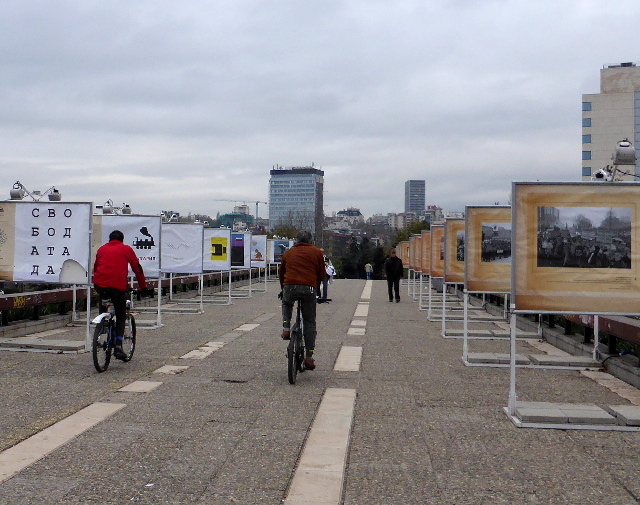 The complete contrast to the features that represented the communist period was a display near the National Cultural Centre which celebrated 25 years since the end of communism. There were evocative photographs and logos from the period right across the bridge, although I couldn’t help but be amused by its proximity to the drive-through McDonalds – was this what the revolution was for? Other highlights were the National Theatre and the attractive gardens out front. 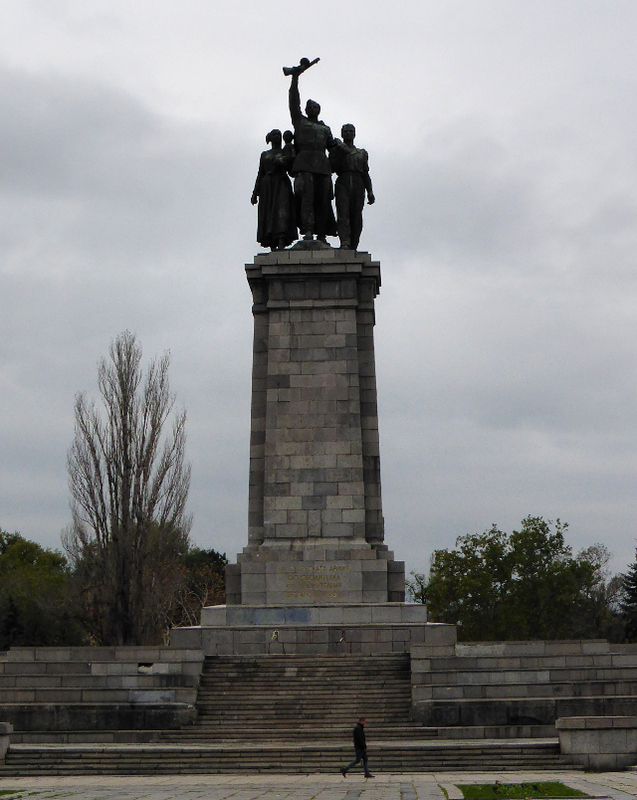 In addition to the physical sights of Sofia I have to say that everyone we met was incredibly helpful and welcoming, from our hosts to hotel staff, restaurants and cafe staff. 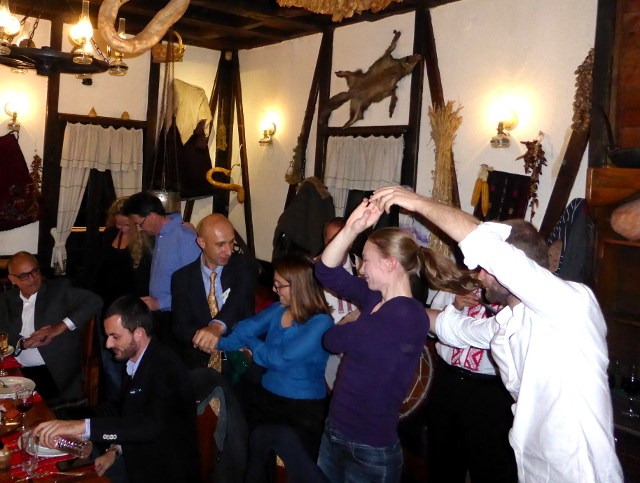 They went out of their way to make us welcome at the Bulgarian themed restaurant – traditional dancing a bonus! And a thank you to the bar staff on Vitosha who said they were closing, and then kept the doors open as long as we were there. I guess that is the advantage of being the only customers in town! 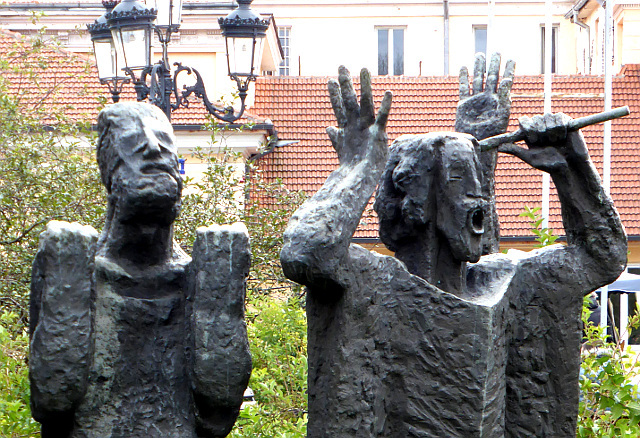 I leave the post with pictures of some striking statues in a square just in front of the Alexander Nevsky Cathedral. My research has failed to turn up their subject but I found them quite moving.